Maybe consider dropping the dual voltage requirement. The advantage of using the OpenEVSE instead of the stock unit on 120v is negligible. After a cooked relay (my fault) I just switched over to an inexpensive definite purpose contactor like the one Chris sells and in the process gave up dual voltage, but in two years I've never used my OpenEVSE on 120 so it was no loss. The simplicity and the robustness of the contactor makes me feel better about the whole system now. The removal of the fuses and crimped connections got rid of multiple potential failure points (including my less than perfect crimps). Whatever you chose, be sure to let us know and share some pics. camasleaf wrote: Thank you Glenn. I will likely go with a 40A contactor and sell my SSRs and my 40A semiconductor fuses (they are big). I know that the car dictates the current, but if I spend the money and put the effort into building an EVSE I want to have the full 40A continuous capability. I am not sure how I will make it work at 120V, I am still brainstorming about that. 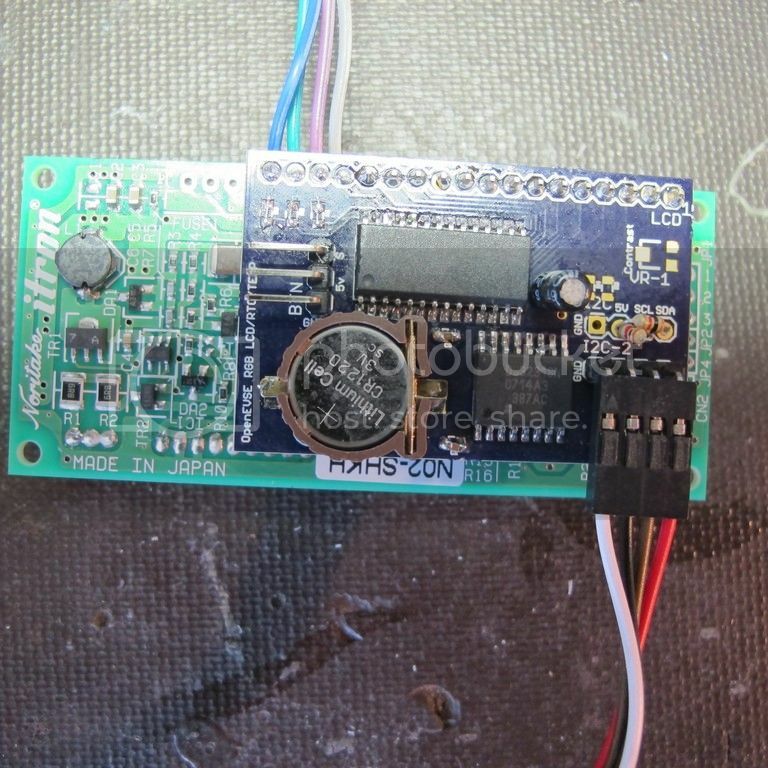 If you go with the Chinese relay it has a 12V coil so it will work on either 120V or 240V. By the way, the 40A cable from Quick Charge power that Chris sells has a cable that is about the size of an ITT L1 cable. Using paired #12 wires makes it very small. I have ordered half a dozen relays from AliExpress. Just do not give them your main email address since they spam it to death. They cost about $15 shipped. You can also get it from the JuiceBox people but it is $15 plus shipping and sales tax in California. I have got relays from 3 separate companies all with the same part number. It truly seems like a generic part. If you are local and replace the relay you can have my spare. I try to keep spares so I can support the units I have constructed. So far none have been needed. AlanSqB wrote: Maybe consider dropping the dual voltage requirement. 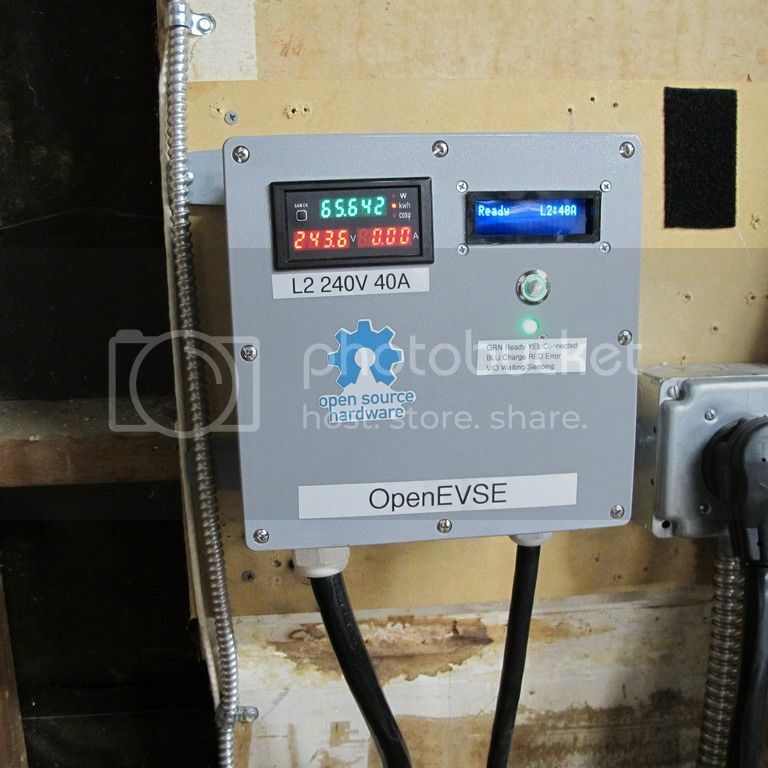 The advantage of using the OpenEVSE instead of the stock unit on 120v is negligible. Except a LEAF (with the 6.6 kW charger) will charge at 27.5 amps on 120 volts (although not part of the original J1772 protocol) if you have an EVSE capable of delivering that current level (with a NEMA TT-30R RV type supply outlet common in campgrounds) and it will charge about twice as fast on such current than with the stock unit. Most every US campground that has electric service offers 120 volt 30 amp service, but you might not want to look too closely at the wiring behind that plug at a lot of them. I can verify that the Leaf will charge at 27.5A at 120V. You can modify the OpenEVSE L1 current table or simply force it to use the L2 table. 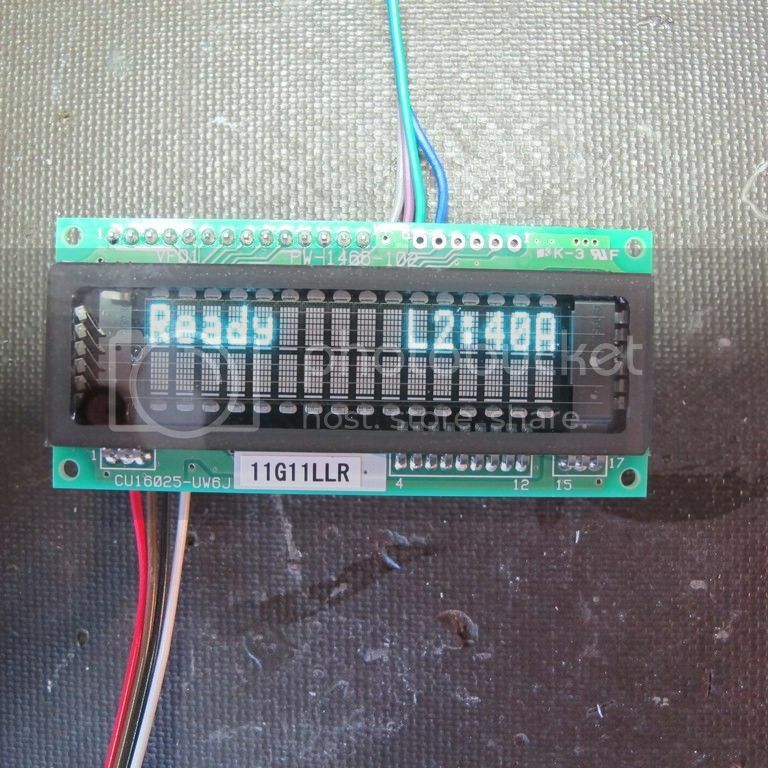 The display will say L2 but that is no big deal. The EVSE does not really care about voltage. It is simply modifying the pilot duty cycle. I have never looked at the RV plugs at the campgrounds. But if they have 120V 30A does that mean they do not have the 240V (30-50A)? Many RV sites have 14-50 240V sockets. I have users say that some are cop out with both l lines strapped to 120V. It would be nice to check before plunking down your money. If the RV uses an L to Neutral than they will not notice. Plainly L to L would then be zero voltage. 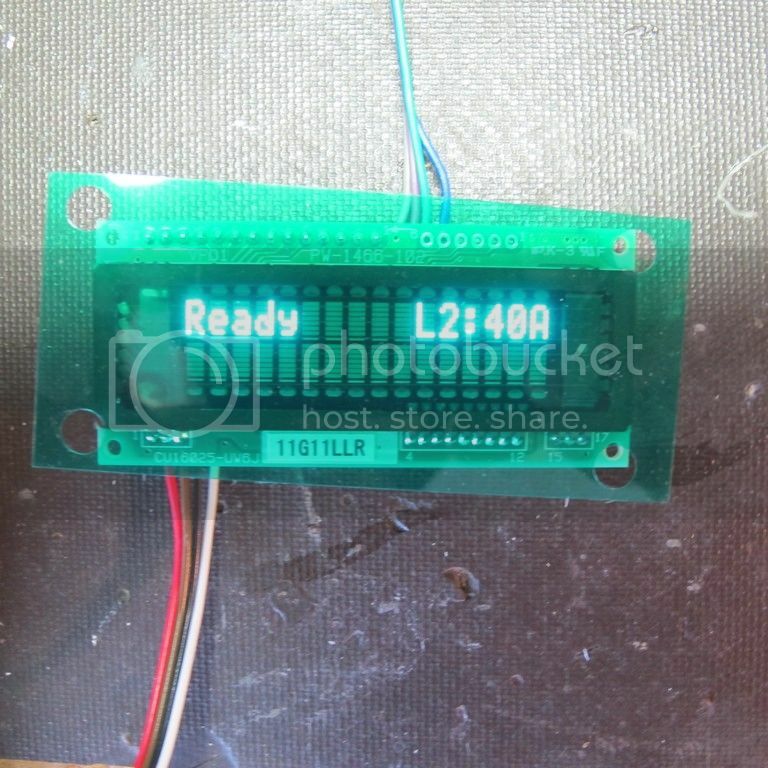 Lately I have been playing with a drop in replacement VFD display. It is available on Ebay for 37.20 shipped from Texas. It only uses 14 pins. The color pins are unused so I ran a RGB LED from them. The cyan filter is brighter but I like the blue one best. I got a 4 color Neewer set from Amazon. GlennD wrote: Lately I have been playing with a drop in replacement VFD display. Wow Glenn, that is really nice! 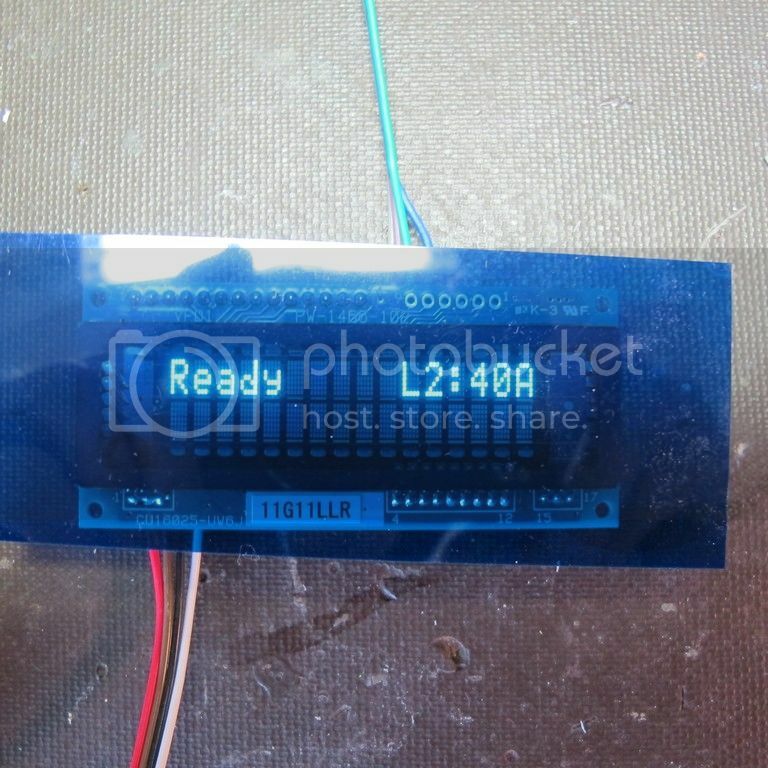 Do you have a project page somewhere for this, including the enclosure? We're looking at OpenEVSE for our L2 charger. We are new Leaf owners. I used to post here but Mike, the forum owner decided I had too many posts and he removed my listings. He wanted me to become a vendor. Since I built OpenEVSE's at cost to keep busy that is not going to happen. I have basically stopped building OpenEVSE's unless I get a really good deal on the parts so it does not hurt to sit on the unit for a while. I encountered the VFD on the Trimble Thunderbolt page and I taught they were neat. They are brighter then the LCD displays even with a blue filter. If you want a complete EVSE then look into Clipper Creek's web site. Unlike most they have the required circuit not the charging current in their Model numbers. Chris Howell offers OpenEVSE stuff at his web store. You can buy complete kits or if you are a geek like me, just buy what you need. Here is a link to Chris' store. He also has posted tutorials that can help your understanding.